Sandwich a toasted marshmallow in between two graham crackers with your choice of fillings. Choose from Pecan Pie, Nutella™ Banana Pie, Coconut Banana Cream Pie, French Silk Pie and Strawberry Rhubarb Pie. Today we’re making s’mores. 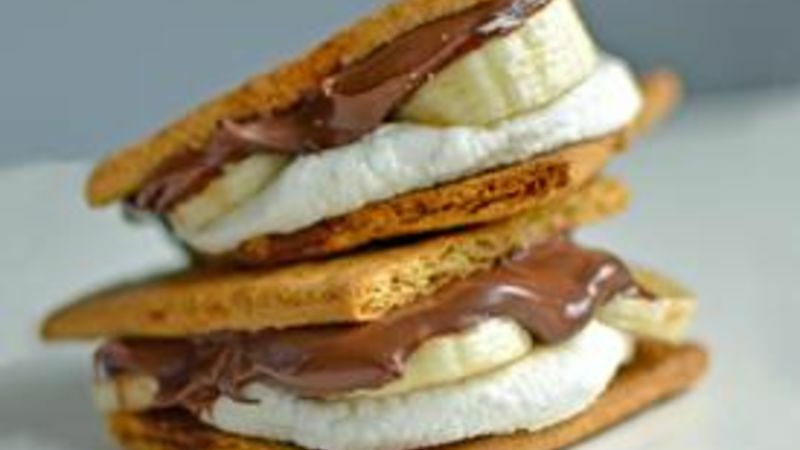 But since s’mores are boring, we’re going to shake it up a little and do some different flavors. That was a little joke. S’mores could never be boring. 1. Pecan Pie S’mores To prep the pecans, you put pecans in a pan on the stove with a handful of brown sugar. Toast them up on medium heat until the sugar melts and then dump them on a sheet of greased parchment paper. Make some extras, they’re good for munching. 2. Nutella Banana Cream Pie What, you’ve never heard of Nutella pie? Just go with it. It’s gonna be a thing. 3. Coconut Cream Pie I used instant coconut pudding and threw in some sweetened shredded coconut too. 4. French Silk You can use already made chocolate pudding or make your own. You can’t really go wrong. 5. Strawberry Rhubarb Pie I used homemade strawberry rhubarb jelly, but you can use any kind of jelly, jam, or preserve that you feel like. Now I know it’s summer and the time is perfect for bonfires on starry nights, but if it's too much effort to make a bonfire, you can always make them in the oven. I turn on the broiler and set each marshmallow on a graham cracker and broil them until toasty. Then you can flip them over and get the other side toasted, and it will be just like a real campfire marshmallow!